So I am a few days late (let’s make that a week) but these monthly posts remain some of my most popular. Allow me to update it for February. There are some things that appeared in earlier months but there are some good reasons that make February different.THE BACHELOR: This IQ Point drainingly awesome show filmed an entire episode in Belize last October. Sure, Ben is totally drippy and unattractive and yes, the girls are catty, bitchy and a bit too into their red wine, but I can’t look away. It’s a total train wreck. And while tonight’s episode (8am EST ABC) is in Panama. Next week, IT IS ALL BELIZE. Mayan ruins, helicopter jump into the Blue Hole, lobster hunting in Caye Caulker, holding sharks at Hol Chan Marine reserve….make sure you watch it on February 13th. And watching it while you are in Belize? OMG. Totally amazing. CARNIVAL: You have probably heard of the big parties in Rio or New Orleans, but San Pedro also does a carnvial. It’s exciting and definitely unique. February 18th is the kick off party with a Carnival Fiesta in Central Park. Live music, a Miss Carnival Popularity contest and different booths will make this fun for kids and adults. Over the next few days, men will dress like women and women like men and dance in the streets. Kids and teens will be painting each other (and you at your request) with colorful house paint. Don’t worry, it comes off pretty easily. Just try to keep it out of your hair. VALENTINES DAY: Belize embraces classic American holidays full force. Halloween is HUGE and Valentines Day is very popular. You’ll see red roses and teddy bears for sale everywhere and most restaurants do romantic dinner time events. Check for ones at Casa Picasso, Blue Water Grill, Portofino Restaurant and really any place up north. Some of the best places for low key romance. SUPERBOWL SUNDAY: Okay…I’m late on this one. But if you are the least bit worried about travelling to Belize and missing your big game, think again. This game is HUGE down here. Lots of bars are having Superbowl parties. THE COOL BIRDS: The birds are still wintering down south. From smaller song birds to huge egrets and herons. Take an early morning walk…they are hard to miss. Here is a big guy who was watching the sunrise with me this morning. Those early morning clouds are already burning off and it will be a gorgeous day. Who wouldn’t want to get married here? Or maybe get married on a tropical island and then take some pics at one of these sites. LOBSTER – YOUR DAYS ARE NUMBERED: Well…not for the lobster…for lobster eaters. The season ends Febuary 15th to give these ugly little buggers a break. So, if you love to eat lobster, do it now! 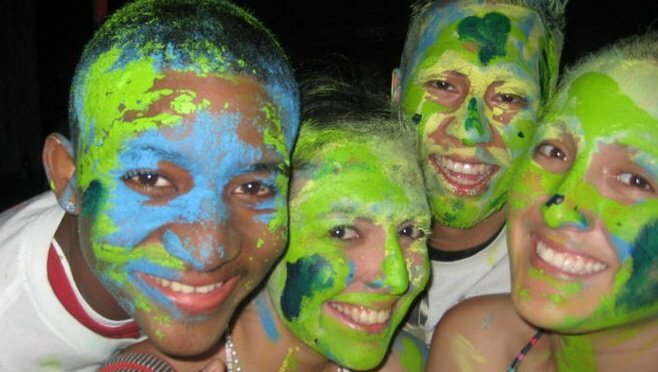 HIGH SEASON: As I said in my January post, High Season in Belize does not mean Cancun style spring break and foam parties. It means that there are LOTS of choices every night and every day. Want to dive the Blue Hole? The trip goes out just about every day. Want to hear live music in town? You have 3 or 4 different choices (see the calendar below) each night. Is karaoke your thing? Your choices are almost endless. Why not try a Sunday afternoon BBQ-hop? Let me suggest: eat at BC’s Beach bar, hear live music at Caribbean Villas and Crazy Canucks. All I’m saying is that you have so many choices. Nice, we’ll still be here and thank you for reminding us to eat lobster before the season ends! March? easter? Oh man…good month. Stay tuned. We leave for Ambergris a week from Tuesday, so watching the Bachelor the night before will be a great kickoff for the trip! Can’t wait! i spent three weeks there in Nov of 2008. I wish I could be there now. It is definitely high on the list of places that hubby and I would like to settle down in when he retires. It’s a very popular place for retirement or part-time retirement. See you guys soon!